I purchased the 22in self-propelled mower from Sears about 3 years ago. My old mower wasn't self-propelled and I felt it was time for an upgrade. Never having had a self-propelled mower before, I didn't know the difference between the front and rear propelled options. Boy did I make a mistake. This mower is front propelled, meaning whenever you make a reversing turn (180 degrees) the propelling wheels don't contact the ground. You have to muscle the unit around the turn. My old mower had large rear tires, making for easy turns over most terrain. This mower has 4 small tires. Not so nice. Other than the complaints about the self-propelling option, the engine has held up well and the deck performs adequately. I have found that the airbox tends to fill with grass clippings very quickly and needs to be cleaned regularly. This means getting out a screwdriver to loosen the screw and remove the cover. A small inconveniene but would have been much nicer with a knob that could be loosened by hand. I use the mulching option with the metal discharge plate installed. Cuts evenly and cleanly. I haven't tried the bagger but it seemed to install easily enough. I'd give it fewer points, but I got it on clearance for $80 after the mowing season started. I guess you get what you pay for. Rear propelled only from now on! Craftsman Mowers are JUNK !! Just returned the third one in 6 months.One was Front wheel drive, the other two were Rear wheel drive,all of them failed within a month or two.. My yard is 3/4 acre..I mow twice a week and the self propell gear case breaks at the cable connection. It is PLASTIC!! and will not live. If you want a lot of frustration and aggravation, then by all means get one..
bought a new one 4 years ago, it last 1 month, so they gave me a replacement. Now this one has a bad transmission too! The repair place wanted $180 to fix it, and they said that Craftsmen keeps them in business! Never again. I had bought this mower through the Raliegh Sears Outlet store. I got it for $100 because it was a discontinued model. I inspected the unit's undercarage and indeed it was new. I have not regreted the purchase since. If you maintain the mower the way specified in the manual, you should have no issues with the mower. Unlike some one else, I have not had clumps everywhere. I think this would happen if you didn't clean the mower after mowing really wet grass, or mowing grass too tall for mulching. I had weeds (some where the thick branchy kind) about knee high when I moved in. The mower handled great with the self propel on through the weeds and thick grass on a steep hill (probably why it was not mowed). I was impressed, because thought I was going to hear the engine bough down, but never did. I used the bag for the thick stuff and the lawn looked as if it never thick weeds on it at all. The mower picked up and mulched and bagged the weeds extreamly well. I have also used the bag to pick up pine needles, and it has done great with this as well. The key start function has been working flawlessly, and starts the first time every time thus far. I also have the large wheels on my model, and I found this to be very helpful. Over all, I would gladly get another one like it, even if at a slightly higher price. Had this mower for 5yrs. Nothing but problems. Engine is fine, but I have had to replace gears in the wheels twice so far to make self propelled feature work. Now one of the front wheels won't roll backwards. Forget about themulching feature, all that does is leave clumps of grass in your yard that you have to rake up. I'll never buy Crapsman again after owning this junk. I bought a Craftsman 6.75 Torque 22 in. Deck Rear Bag Front Propelled Lawn Mower with High Wheels. This lawnmower seems to just do the work for you. I am a female and even I find it easy to use. It turns corners closely and easily, especially around trees, your swimming pool, and even swing sets. Mine seems to run like a top and I have not had a lick of problems yet with it, and I have been using it twice a week, every week, for the last two and a half months. You can adjust it to be high enough off of the ground to mow over a stump that is cut low to the ground or if you have a yard with a lot of small rocks. The catch bag is easy to remove and easy to re attach. The only thing I would suggest, though, is to wash the entire mower, including the underneath and the blades with a hose and then to let it dry in the sun before you put it away. That way the wet grass doesn't rust your mower out. Last summer I purchased the Craftsman 6.75 Torque 22 in. Deck Rear Bag Front Propelled Lawn Mower, and I love almost everything about it. First and foremost is the fact that because it has a very wide twenty two inch cutting area, as well as by being self propelled, it takes a very little period of time to cut my lawn. I have had self propelled lawn mowers before that moved way too quickly, but not this one, it goes at the proper pace so I do not have to run behind it. I also like the rear bagging feature. My yard is small enough it only needs one bag in order to mow the lawn, so I do not need to use the mulching feature. Since I don’t mulch, the bag being placed in the rear is important because it means that it is easier for me to cut right up to the fence line, and turn without having to worry about getting the bag caught up on anything. I like the fact that I can change the cutting height, with these powerful blades that is very important. Usually I keep it at medium height, but right before vacation I use a very low setting, so that by the time I get back, the lawn does not look too overgrown. Another great feature is the deck washing feature. I used this once at the end of the summer just to see how it worked. Basically, you attach a garden hose to the appropriate connector on the lawn mower, and turn on the water. It does not work as well as a regular pressure washer, but it does a pretty good job of removing built up dirt and grime, as well as washing away loose dirt. All and all it is a good powerful unit, that I would recommend to anyone, especially for the price. I have a craftsman 6.75 Torque 22 in. Deck Rear Bag Front Propelled Lawn Mower. It has a Briggs & Stratton Engine with 6.75 ft-lbs gross torque. It has a smooth start exclusive to craftsman. The mower came with a 2 year limited warranty. It is self a Propelled mower so it does the work and not you. It has a mulching system that can't be beat. I like the way it cuts the grass very cleanly. I don't have to worry about it not picking up all the clippings. The mower has been a very durable good machine. I have had no problems with it what so ever. I am impressed with the power it delivers. I have to cut grass on a steep hill and the self propelled lawn mower runs up those hills like they are not even there. The fuel efficiency seems to be very good as well with this machine. With this mower weighing only 92 pounds it is very easy for me to handle. I especially like how easy it is to adjust the height I want to cut my grass at. Overall I would rate this lawnmower an 8 out of 10. I highly recommend this product for people concerned about the cost of a new mower vs. quality of the product. 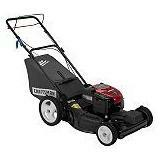 In my opinion you are getting the best bang for your buck when you purchase the Craftsman 6.75 Torque 22 in. Deck Rear Bag Front Propelled Lawn Mower for your next lawnmower.